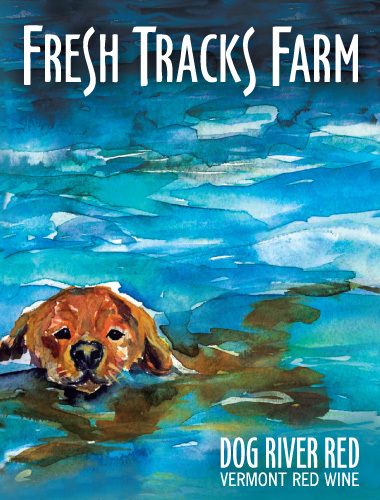 Dog River Red is a celebration of the Dog River Valley and our four-legged friends. A smooth, off-dry red, it offers luscious flavors of dark berries and baking spices before moving into a dry finish. A versatile wine, we often serve it chilled to highlight its structure and lively fruit. We love this wine on its own, but the leftovers (if you have any) are a fantastic base for your favorite sangria or glögg! Grape Information: Dog River Red is made from a blend of FTF-grown St.Croix and FTF-grown Marquette. St.Croix is an Elmer Swenson variety from Wisconsin that we’ve planted here in Vermont and made our own. The Marquette grape is a delicious, northern “grandchild” of the Pinot Noir, and is growing in popularity and prestige across colder wine regions. Both grape varieties are resistant to frigid temperatures and menacing diseases. Suggested Pairings: Buffalo Chicken Quinoa Bites, home-made chili, mole sauces, and even Red Wine Brownies!